This entry was posted in assessment, elearning, learning opportunities, MOOCs, portfolio and tagged #edcmooc, #oldsmooc, MOOCs. Bookmark the permalink. Thanks for this – this is exactly where I am and where I am coming from too. Although I did not take part in OLDS MOOC, mainly because it was at the same time as EDC MOOC, I can see the benefit in learning how to manage my time in accordance to what is available, when it’s available, and I now know what to look for to better plan my MOOCing. I also planned a blog post for each week and this was far more valuable to me than the final artefact, for which I also achieved the certification. I’m only planning one more MOOC at the moment, the ALT ocTEL one – I’ hoping that if anyone can do a MOOC properly, it’ll be the Association for Learning Technology! Thanks for this, yes the self reflection has been crucial for me too, but again in terms of say 18 year olds – not sure that this strategy would work so well for them? Good luck with ocTEL – I’ve decided that would be a mooc to far for me just now but no doubt will get pulled in to the twitter conversation at some stage. Hope it goes well for you too and will look forward to your blog posts. This is something that I have also been considering (see towards the end of my post from yesterday, where I reference your tweet about Suzanne’s comment). I still have to write up my overview of my edcmooc experience. Like you, I felt that any learning that occurred for me was via my blog and interacting with a very small number of peers on the course. In fact, when it came to my digital artefact – I just submitted my week 2 blogpost. I also signed up for ocTEL, in a moment of madness. You’ll know from my blog how it’s going. Thanks for a really interesting blog post. I’m currently taking a final Masters module with the Open University, looking at Openness and Innovation in e-Learning. The current part of the module is being taught in an OpenLearn MOOC, alongside hundreds of other learners. This is a real shift from the closed, ‘safe’ environment that the locked down module VLE/forums offer, and I must say I’m finding a real struggle to a) keep on top of all the posts and b) engage in the weekly activities. I think my for my first MOOC experience it would have been great to have the choice to continue or to ‘drop-out’ but given that participating in the MOOC is a requirement of the module that isn’t an option. I guess that your measures of success depend on your reasons for taking a MOOC in the first place. For me, taking a MOOC is a bit like reading a book. I make a personal commitment to finish the book, I invest a certain amount in choosing it and reading the first few chapters and if I give up (which, actually, I’ve only done a handful of times in my whole life) I feel like I’ve failed. No-one else has to care one way or the other. No one has to give me a certificate to say that I’ve finished reading the book – can you imagine! That said, I admit to liking the feeling of seeing a full set of ‘results’ obtained during the MOOC. But that is very much a personal satisfaction. If I was taking a MOOC for professional reasons (and the one I’m taking currently (and possibly about to drop tbh) comes closest to that category in all the MOOCs I have taken) then I’d probably tell various people at work that I was doing the MOOC – but I wouldn’t consider the certificate of completion to be evidence of anything and success… well, I’m not actually sure what would constitute success if I’m honest. I wouldn’t expect anyone else to be interested in a certificate either. If I was on an interview panel and a candidate told me about a MOOC that they’d taken I’d be interested… but only in the same way that I’d be interested about any other relevant activity they’d undertaken – I dunno, volunteering or Duke of Edinburgh or something like that. But that’s one of the troubles with ‘formal’ education – people put too much emphasis on the ‘qualification’ and not enough on the more rounded aspects of what ‘being educated’ and ‘interested in stuff’ makes you. FWIW, I’ve also taken MOOCs as part of a group – which is a bit like reading a book as part of a book group in that there are people around that you can talk to after (or during) the reading. But, again, if people drop out no harm is done, except that there’s less people to discuss things at the end (or as you go along). Very insightful post. 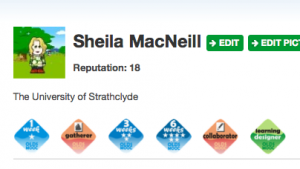 I can promise you if I ever start a MOOC it will allow people to take the badges with them I hear you say you are in? We have to wait and see what the OU’s FutureLearn will offer and how do employers then view such MOOC badges/certificates etc. I am sure the employers are thinking if the universities are going to run these new breed of courses, they should find a way to accredit these and make part of learning that is formally assessed and awarded credits in the same way as other courses they run. It will be a lot easier that way for MOOCers and Employers no? I’m really interested in the idea that MOOCs may re-awaken interest in user-owned portfolios – something we’ve been talking about for years and of course people already have in many different guises, but something I’ve noticed going ‘off the radar’ a bit in current debate. Maybe time to give it another look under the MOOC hype? I have only taken one MOOC so far, a “connectivist” MOOC called “ETMOOC” (Educational Technology and Media MOOC: http://etmooc.org). I looked in on a Coursera “xMOOC” once, and I am starting the #h817open MOOC on open education from the Open University (Weller). I’m finding that the last one, the one I’m starting, is more structured in the sense of having specific activities for each week, and suggestions to post one’s answers or artifacts on those activities to one’s blog and/or the discussion board. In ETMOOC, by contrast, there were some suggested blog topics and activities, but it was very much emphasized that these were optional. What we were encouraged to do was to write *something* related to the course topics on our blogs. And it was clearly stated that the course had different topics each two weeks to allow people to drop in and out as they wished. There was no pressure to “finish” or earn some kind of certificate or badge. For me, that structure of ETMOOC really worked. There were weeks I just couldn’t keep up for various reasons, and I felt no guilt about it. If the suggested blog topics were uninteresting to me, I just wrote about something else. And I was SO engaged in this course as a result–I focused on what I had time for and what was most meaningful to me. I think a portfolio might have been useful for me in ETMOOC, much more so than a certificate or badge. I could then have recorded the specific things that I did, that I discovered, that were meaningful to me, etc. Instead, what I did was create a Storify board with links to blog posts, presentations, Tweets and more to tell the story of my participation in ETMOOC. It’s specific–it says exactly what I did and what I thought about, which is much more than a badge or certificate would say. I’d rather have a portfolio because Storify may not be around for a long time! This is a long way of saying that I think portfolios would be more useful to document learning in MOOCs, and also that there can be value in MOOCs that don’t suggest or encourage “finishing” in some traditional way. Hi Christina, Andy, Manish, Sarah and Adam. Thanks all for your really helpful comments. Andy, I like the MOOC=Book metaphor and know that many people do form MOOC groups. I have a slightly bigger concern that if, as many claim, teenagers don’t need to go to Uni/college but can create their own equivalent learning paths via MOOCs that they may not really have the skills/support to cope with this kind of learning or the skills/support/space to show their learning in a contextualised way. We’re all in early days and I would like to see some thought given to this wider issues rather than the apparent emphasis on the MOOC platforms/providers. Interesting post; in a one-size-fits-all Mooc, trying to measure learning and what the statement of accomplishment means is, as you have highlighted, very challenging indeed. I participated on the #edcmooc too and a question came to my head: how many of the people who finished it were far beyond its baseline level? This was supposed to be an introductory leve 4 course – 1st year undergraduate – but approximately two-thirds of the participants were people with postgraduate qualifications, according to stats shared by one of the tutors in the second google hangout. One may claim that each person could get something out of the #edcmooc, regardless of their level as they could engage in different activities and discussions, with varied levels of reflection. While this may be true, I also learn from twitter by getting directed and reading blogposts like this or other sources such as the Times Higher Education website etc. Many of us these days read some blogposts, short articles and leave our comments online, in a Mooc-like fashion; should we be given statements of accomplishment for that? Thanks for your comment. You’ve highlighted a key aspect of #edcmooc in terms of the demographic of the learners. I suspect many signed up just to see what a MOOC was and not really to get any formal accreditation. MOOC has some benefits and also some disparagement~Firstly, It is done remotely, So it is impossible for a learner to catch up all information provided by online courses. Now benefit~ MOOC is a great opportunity who are not free to go to university or other institute for classes, this online cours gives one opportunity to complete his / her graduation in home. If some would find a good teacher, I would appreciate it. What do you think about a MOOC compare to Online Postgraduate Programmes provided by the University? It’s hard to compare MOOCs to online PG programmes as their models of teaching are so different. The later have structured (paid for)support which MOOCs don’t have. There are an increasing number of PG and UG courses that are allowing aspects of their programmes to be openly available, which is an interesting model, and a good way for a potential student to try a course. How to manage learning, reflect on learning, develop the artefact and (if you like) showcase your certificate or badge, and so on are all supported by ePortfolio learning. I am on MOOC number 2, and am using an ePortfolio to pull the study questions together, aggregate relevant materials, write blogs etc. Admittedly, this does require skills in managing learning, but it’s working for me at the moment. We are all finding our own methods to manage our own learning, for some, the quiz or certificate is a useful goal to aim towards and for others it doesn’t hold any significance. I would be interested to see how MOOC uptake can be widened into a genuine lifelong learning context, and what tools, skills, communities or methods can support this. Thanks for your comment. I think that most MOOC providers are actually ignoring the need for tools like eportfolios, I think that they could be key in understanding “success’ and indeed lifelong learning. Thanks for this post. The questions you pose chime with some of the thoughts I’ve had through my experiences with a couple of cMOOCs and the online courses I’ve run. I have enjoyed being able to pick and choose what I wanted to focus on in the MOOCs. While I have participated for my own interest and not to get a certificate or badge, I am aware that I have probably done quite a bit of learning, as I’m sure most people have, that is completely unrecorded. In both of the MOOCs there have also been topics which are not represented in my CV, current role etc that I might like to have some kind of recognition for. One of the things that has occurred to me is that I might want to submit some ‘evidence’ after a MOOC has finished in relation to the activities in a particular section that I might want to gain some kind of recognition for. I liked the approach by the School of Webcraft in their pilot of Open Badges using open assessments (the detailed information on the pilot seems to have moved but here is an overview of it from Erin Knight http://erinknight.com/post/3218758524/school-of-webcraft-badge-pilot). Essentially, a number of open web development challenges and corresponding assessments were set in Wikiversity to allow learners to take the challenges when they wanted and submit material for assessment. The learner’s evidence could then be assessed and voted for by peers or web developer ‘gurus’ from the web development community or by stealth when some pre-defined but unknown task was achieved through the process of creating something. Learners were then issued an Open Badge. Directions were provided for the assessments linked to each badge, which included instructions of the assessment process, how they would be assessed (e.g. who would do the assessing, if it would be one or multiple assessors, the rubric that would be used, and the requirements needed to complete the assessment). Thanks Grainne -really interesting. Yes definitely need more learner control and experiments with badges.